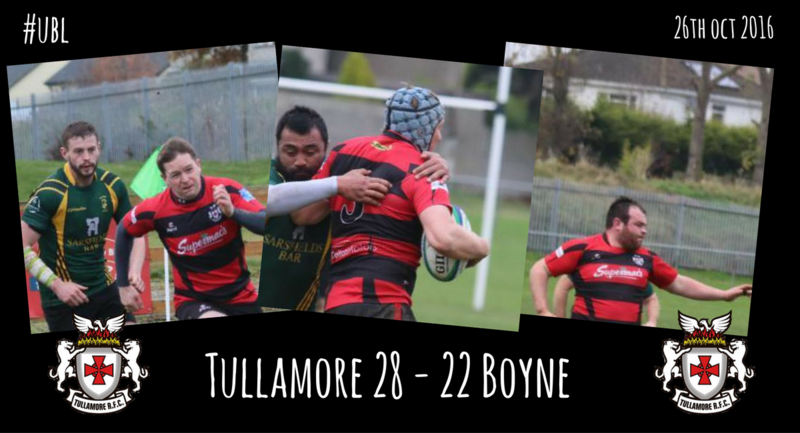 Tullamore made the long journey north to Drogheda to battle old junior rugby rivals Boyne RFC on Saturday last. This fixture has had plenty of bite and niggle in recent seasons and a strong rivalry has developed. Thankfully Tullamore have held the upper hand in recent years and this weekend did just enough to continue this trend. Tullamore have been notoriously slow starters this season, but for once they came out of the traps with plenty of energy and gave an excellent opening 12 minutes performance, monopolising possession and territory from the kick off and earning a kickable penalty for the ever reliable Karl Dunne to ping over for a deserved early lead. There was plenty more of the ball for Tullamore and although they found it hard to breach the Boyne whitewash they did threaten on many occasions. Ben Ridgeway looking particularly dangerous with a few trademark breaks and Dylan Kelso and Conor Dunne also making some headway with quick feet, however Tullamore just couldn't find the golden pass and against the run of play Boyne drew level from a scrum infringement after 30 minutes of play. From here on the Tullamore pack rolled up their sleeves and took the fight to Boyne with renewed vigour. After 38 minutes the hard working Kevin Browne wriggled over from the side of a strong rolling maul to score a well deserved try which helped to push Tullamore 8 - 3 in front. Karl Dunne unfortunately was off target with the conversion. With this score coming just before halftime, calm heads and discipline were called for, but what came in the next 4 minutes will drive the Tullamore coaching ticket mad as first Leon Martin and then Ger Molloy were sent to the bin for daft penalties. Under pressure now, Tullamore were glad to only concede 3 points before the break. Discipline has now become a serious problem for this Tullamore team and they simply can't expect to win games when constantly losing men to the bin. An injury to Cathal Feighery further stretched Tullamore's resources. Arguably Tullamore's most influential forward these days, management will be praying he comes right before next Saturdays battle against a traditionally abrasive Middleton. 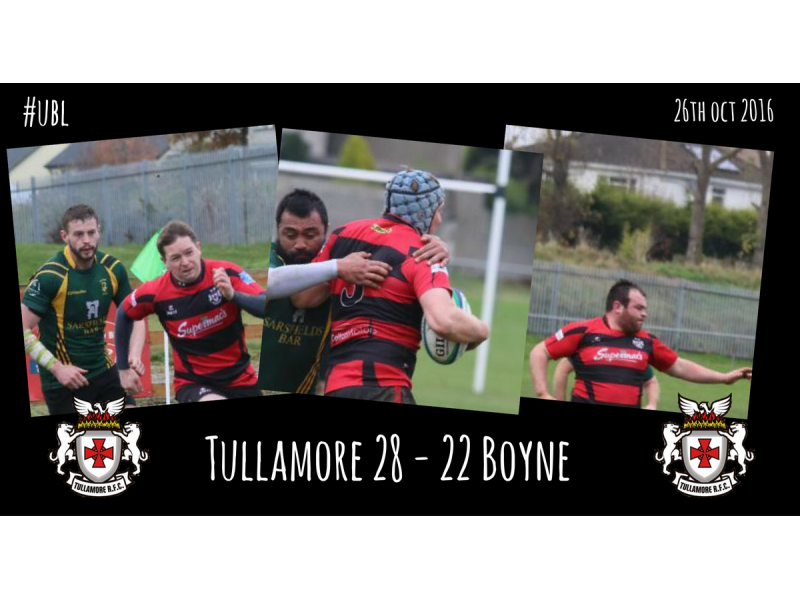 With Tullamore still down to 13, Boyne upped the pace of the game and scored a well worked try after 43 minutes to take the lead for the first time in the game. Tullamore were up against it now and Boyne were visibly brimming with confidence, sensing a first win over their old rivals since 2011. However, in their time of need, Ben Ridgeway stepped up to the plate and pulled a rabbit out of his hat. After a good turnover at the breakdown by young flanker Colm Heffernan, the quick thinking Ridgeway tapped and went himself with the resulting penalty and managed to go all the way to the posts for a tonic try. Karl Dunne jabbed over the simple conversion and Tullamore were back in front by 2 points with 50 minutes gone. Further Tullamore misdemeanours at the breakdown kept Boyne in the game and longtime Boyne servant Niall Kerbey was kicking like a muel, driving over some fine long distance penalties to put Boyne back in front. Thankfully Karl Dunne's kicking radar was in check and he kept Tullamore in the game with a few well taken penalties of his own. The decisive scores of the game were to be scored by Karl's younger brother Conor. First he scored a beauty of a try, making an O'Driscoll-esque outside line break, before having the pace to race clear of the cover and slam down under the posts. He nailed the conversion and a further long range penalty minutes later to give Tullamore a 9 point buffer with only 5 minutes left on the clock. In fairness Boyne never waved the white flag and earned themselves a losing bonus point after another well struck Kerbey penalty.A game that really could have went either way, Tullamore's superior threat in the backline being the difference, where Ben Ridgeway, Dylan Kelso and Conor Dunne all sparkled. Up front Kevin Browne, Ger Molloy, Ivor Deverell and young flanker Colm Heffernan all impressed. Next Saturday sees Tullamore lock horns with Cork side Middleton RFC. With Tullamore now lagging 7 points behind leaders Rainey, another win is a must if Tullamore are to stay in the hunt approaching the half way point. Tullamore Team: K Dunne, T Gilligan (c), C Dunne, A Wynne, D Kelso, B Ridgeway, A Deverell, K Browne, L Martin, C Heffernan, I Deverell, M Tormey, G Molloy, C Feighery, D Lowry.